Traveling during the holidays can be a lot of work. So many people travel during this time of year, that I sometimes even wonder who is at home to receive these guests! Here are travel tips to simplify your holiday travels, including packing tips and ways to simplify your homecoming. Find luggage that will be comfortable with a simple change or two of clothing plus your other travel essentials. The ideal luggage will help you to pack very efficiently, with everything important right at your fingertips and with you at all times. Finding the right combination of luggage will definitely simplify your traveling! For example, on one trip, my daughter and I had only a few minutes to make our connection so we RAN from one end of O’Hare Airport to the other to catch our plane. Had our briefcases been on our shoulders, they would have flopped uncomfortably all over the place while we were holding onto our rolling luggage. But since our luggage was stacked efficiently; we were each able to pull our bags rather than carry them, and there was a place for everything so nothing could fall out. AND when we opened our bags, we could still reach in and get what we needed at a glance. Nothing had shifted in the bags. When you pack your bags, try rolling your suits and other articles. I do this with even my fancy clothes and they look just fine when I unpack and hang them up. 1. Decide on basic outfits. Spread these out on your bed. 2. Gather the shoes, stockings, undergarments, handbags, jewelry and other accessories for each outfit. 3. Now start putting these things in your suitcase. 4. Put socks inside of shoes and handbags. This keeps them from being squashed while in transit. 5. Put shoes inside of plastic bags so as not to soil any clothing that comes in contact with them. 6. Put jewelry and any medications in a little pouch that will fit in your purse. Never pack your irreplaceable items. 7. Put shampoo, conditioner and other toiletries in a Ziploc freezer bag that won’t leak. 8. Take a plastic bag for dirty laundry. The above list will work fine for packing lightly for a short trip too. Just decide on fewer clothes that still mix and match — for example, 2 pairs of pants with 4 mix and match tops, and two pairs of shoes. Do remember that you can always buy something later that you forgot to bring from home. Leave your home neat and in order. When you come home tired from traveling, you won’t have to deal with cleaning. It is wonderful to return to washed and folded laundry; a clean kitchen with counters cleared; trashcans and newspapers taken care of by neighbors or friends; and most of all, your own bed. Be sure your car has been properly taken care of by a mechanic ahead of time if you are driving. 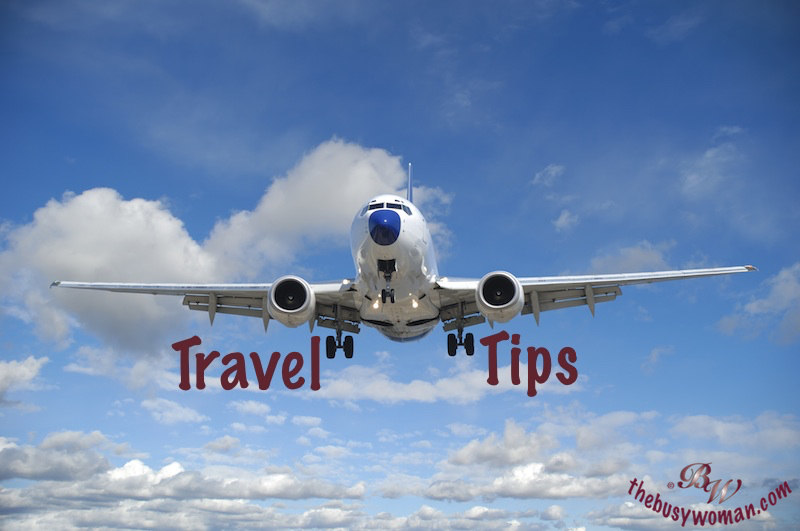 If you are flying, be sure to arrange your ground transportation well in advance at both ends. Remember that you will not be able to take even a little Swiss army knife, hair spray or sewing scissors etc. on board an airplane. If you have a lot of extra luggage to take with you, such as gifts, consider mailing boxes via UPS ahead of time or using a separate suitcase. A trusted neighbor should also have a key to your home in case of emergency, and a copy of your travel itinerary. Traveling can actually be a fun adventure if you take time to plan ahead, so you can enjoy the actual journey. There are many nice people to meet along the way, new things to see, quiet time to read and relax. Find things you can do while traveling that you haven’t had the time to do while at home. For example, when our family takes car trips, we pack CDs we haven’t been able to listen to yet, and we ask all sorts of questions to find out more about everyone. On my many plane trips, I read, organize my planner and make new schedules, redo my address book, and read some more! Bon voyage! !